Guide to Franklin County Virginia ancestry, family history, and genealogy. Birth records, marriage records, death records, census records, family history, immigration records, and military records. Franklin County lies in the Western Piedmont of the Commonwealth of Virginia and was named for Benjamin Franklin, the Governor of Pennsylvania, where many settlers originated. 1785--Franklin County was created 17 October 1785 from Bedford and Henry Counties. For tips on accessing Franklin County, Virginia Genealogy census records online, see: Virginia Census. Franklin County fell within the bounds of the Strawberry Association. Wingfield, Marshall. An Old Virginia Court: Being a Transcript of the Records of the First Court of Franklin County, Virginia, 1786-1789, with Biographies of the Justices and Stories of Famous Cases. Memphis: West Tennesee Historical Society, 1948. Available at FHL; digital version at World Vital Records ($) additional index at FHL; digital version of original edition at Ancestry ($); and World Vital Records ($). More than 175 genealogies have been published about Franklin County families. To view a list, visit Franklin County, Virginia Compiled Genealogies. 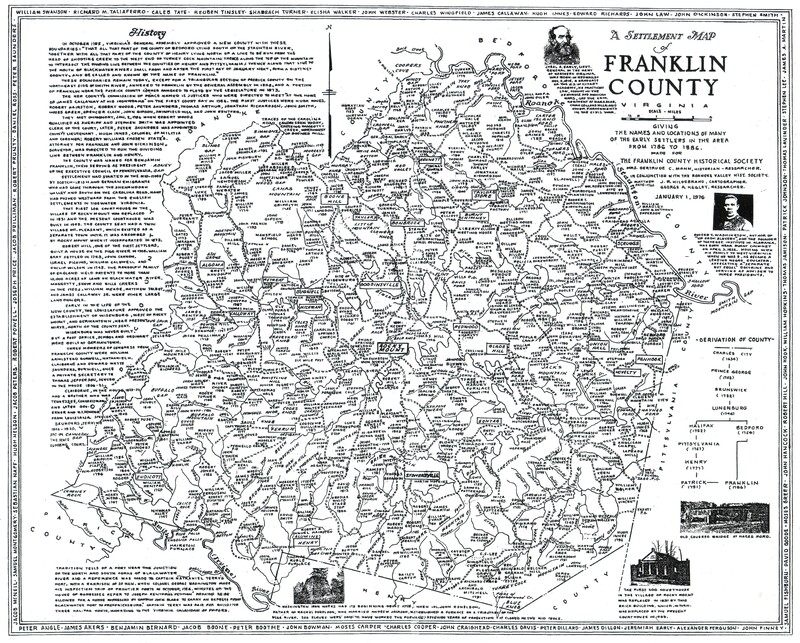 An early settlers map is available for Franklin County. The cartographers plot the locations of pioneers from 1786-1886. Find the map for free online, as well as an alphabetical list of names. The Family History Library has a full-scale copy: FHL Map 975.568 E7h. Claiborne, John G. Franklin County, Virginia: Historical and Industrial -- Past, Present and Future. Rocky Mount, Va.: The County News Print. Co., 1926. Available at FHL; digital version at Ancestry ($). Wingfield, Marshall. Franklin County, Virginia: A History. Berryville, VA: Chesapeake Book Co., 1964. Available at FHL; digital version at World Vital Records ($). A Settlement Map of Franklin County Virginia. Available online. Franklin County men served in the 42nd and 110th Regiments. - 2nd Regiment, Virginia Cavalry (Confederate). Company D (Franklin Rangers). - 10th Regiment, Virginia Cavalry (1st Cavalry Regiment, Wise Legion (Confederate). Company K (Rosser's Mounted Rangers, Virginia Rangers, or Texas Rangers). - 24th Regiment, Virginia Infantry (Confederate). Company B (Franklin Rifles) and Company D (Early Guards). - 37th Battalion, Virginia Cavalry (Dunn's Battalion, Partisan Rangers) (Confederate). Company A and Company G.
- 42nd Regiment, Virginia Infantry (Confederate). Company K (Franklin Invincibles). - 47th Battalion, Virginia Cavalry (Confederate). - 57th Regiment, Virginia Infantry (Confederate). Companies B (Franklin Sharpshooters) and C (The Franklin Fireaters). - 58th Regiment, Virginia Infantry (Confederate). Companies D and E (Hale's Ford Franklin Guards). The Virginia Newspapers Project identifies local Franklin County, Virginia Genealogy newspapers. Watts, Dorothy C. "Petitions of Residents of Bedford and Henry Counties, Virginia, in Favor of and Opposed to a New County (Franklin)," The Virginia Genealogist, Vol. 24, No. 2 (Apr.-Jun. 1980):83-89; Vol. 24, No. 3 (Jul.-Sep. 1980):192-199. Available at FHL; digital version at American Ancestors ($). [1786-1803] Franklin County Personal Property Tax Lists 1786-1803 (images); digital version in Tax List Club at Binns Genealogy ($). Weaver, Jeffrey C. The 1786 Franklin County, Virginia Personal Property Tax List (New River Notes) - free. [1788, 1799] Indexed images of the 1788 and 1799 Personal Property Tax Lists of Franklin County, Virginia are available online, courtesy: Binns Genealogy. Tax List, 1800, Bedford Genealogical Society Newsletter, Vol. 8, No. 4 (Nov. 1997); Vol. 9, No. 1 (Feb. 1998). Tax List, 1800, Virginia Genealogist, Vol. 22, No. 2 (Apr. 1978); Vol. 22, No. 3 (Jul. 1978); Vol. 22, No. 4 (Oct. 1978). Tax Relief in 1812, Times of Franklin Before & After 1786. Rocky Mount VA: Jun 2007. Persons with Taxable Property in Robert Hairston's District, 1830, Times of Franklin Before & After 1786. Rocky Mount VA: Aug 2004. Personal Property Tax List, 1830, Virginia Appalachian Notes, Vol. 8, No. 1 (Feb. 1984); online at Roanoke Public Library - free. Personal Property Tax List, 1840, Virginia Appalachian Notes, Vol. 9, No. 3 (Aug. 1985); online at Roanoke Public Library - free. 1786-1915 - Franklin County Marriage Index 1786-1915. Batch M868775 at FamilySearch - free. 1786-1858 - Wingfield, Marshall. Marriage Bonds of Franklin County, Virginia. Memphis, TN, USA: West Tennessee Historical Societ, 1939. 1967 index available at FHL; 1973 reprint available at FHL; digital version of original edition at Ancestry ($). 1853-1871 - Franklin County Death Index 1853-1871. Batch B868776 at FamilySearch - free. USGenWeb project. Has maps, name indexes, history or other information for this county. ↑ 2.0 2.1 Handybook for Genealogists: United States of America, 10th ed. (Draper, Utah: Everton Pub., 2002), Franklin County, Virginia. Page 713 At various libraries (WorldCat); FHL Book 973 D27e 2002. ↑ Handybook for Genealogists: United States of America, 10th ed. (Draper, Utah: Everton Pub., 2002), Franklin County, Virginia . Page 710-723 At various libraries (WorldCat); FHL Book 973 D27e 2002; Alice Eichholz, ed. Ancestry’s Red Book: American State, County, and Town Sources, Third ed. (Provo, Utah: Ancestry, 2004), 715-720. ↑ 4.0 4.1 4.2 4.3 4.4 4.5 4.6 Robert Baylor Semple and George William Beale, A History of the Rise and Progress of the Baptists in Virginia (Pitt and Dickinson, 1894), 338-339. Digital version at Google Books. ↑ Stuart Lee Butler, A Guide to Virginia Militia Units in the War of 1812 (Athens, Ga.: Iberian Pub. Co., 1988), 85. FHL Book 975.5 M2bs. This page was last modified on 23 April 2019, at 22:36.